Rascals has to be the coolest spot in town. The bar at 2128 Madison played host to none other than Axl Rose and his band, Guns N' Roses, early Wednesday morning. Rose and the other band members, who played a dynamite show Tuesday night at The Pyramid, stopped by the bar about 3 a.m., said Charlie Barnett, who co- owns the bar with Scott Fruhman. Not only did Guns N' Roses hang out for several hours, but all the members of the band jammed with Son of Slam, a local band, Barnett said. Fruhman met Guns N' Roses crew and members of the band in Los Angeles. So, when the band came to town, the members naturally visited Rascals, Barnett said. Some of the crew and band members held a private party Monday night at Rascals. But after Tuesday's concert they "wanted to come in and party" again, Barnett said. There was a "limited crowd" in the club that morning. Rose, who didn't attend Monday night's party, showed up at Rascals after the concert wearing a full-length fur coat, Barnett said. And he didn't order anything to drink. "He was a nice guy. I went over and shook his hand and told him I appreciated him coming. He was just as cool as he could be." As Son of Slam played, one Guns N' Roses member after another got up to jam. "Axl was sitting in the crowd. He saw everyone playing with the band. He was digging it. I saw him take his coat off. Before I knew it he was on stage jamming." There was only one incident at the club, Barnett said. One man wanted to take a picture of Axl. But Guns N' Roses security took the film out of the man's camera and escorted him out of the club. Guns N' Roses is one of a growing number of hot bands that have frequented Rascals, which is kind of an 'in' place for rock groups, Barnett said. Members of Warrant, Tesla, Black Crowes, Soundgarden, Lynyrd Skynyrd and U2 have been at his bar, he added. He recalled when U2 visited. "Nobody recognized them. They drank beer, tipped the waitress $20 and left." Warrant was responsible for local band Roxy Blue being signed to a major label, Barnett said. "Warrant was in town. They came in to party at the bar. They liked Roxy Blue (playing that night) so well, they told their management about them." So, if you go to Rascals, don't be surprised who you bump into. "We're not a yuppie bar. We're not the classiest joint in town. We don't sell Dom Perignon. We're just an old beer bar." Guns N' Roses will be wowing the crowds on Tuesday at The Pyramid in Memphis. It’s going to be a sellout audience. 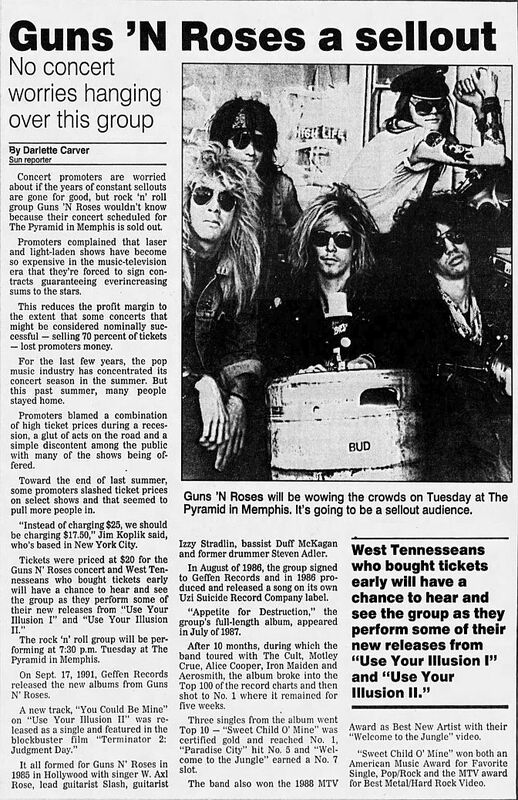 Concert promoters are worried about if the years of constant sellouts are gone for good, but rock ‘n’ roll group Guns ’N Roses wouldn’t know because their concert scheduled for The Pyramid in Memphis is sold out. Promoters complained that laser and light-laden shows have become so expensive in the music-television era that they’re forced to sign contracts guaranteeing everincreasing sums to the stars. This reduces the profit margin to the extent that some concerts that might be considered nominally successful — selling 70 percent of tickets — lost promoters money. For the last few years, the pop music industry has concentrated its concert season in the summer. But this past summer, many people stayed home. Promoters blamed a combination of high ticket prices during a recession, a glut of acts on the road and a simple discontent among the public with many of the shows being offered. Toward the end of last summer, some promoters slashed ticket prices on select shows and that seemed to pull more people in. “Instead of charging $25, we should be charging $17.50,” Jim Koplik said, who’s based in New York City. The rock ‘n’ roll group will be performing at 7:30 p.m. Tuesday at The Pyramid in Memphis. On Sept. 17, 1991, Geffen Records released the new albums from Guns N’ Roses. A new track, “You Could Be Mine” on “Use Your Illusion II” was released as a single and featured in the blockbuster film “Terminator 2: Judgment Day." It all formed for Guns N’ Roses in 1985 in Hollywood with singer W. Axl Rose, lead guitarist Slash, guitarist Izzy Stradlin, bassist Duff McKagan and former drummer Steven Adler. In August of 1986, the group signed to Geffen Records and in 1986 produced and released a song on its own Uzi Suicide Record Company label. “Appetite for Destruction,” the group’s full-length album, appeared in July of 1987. After 10 months, during which the band toured with The Cult, Motley Crue, Alice Cooper, Iron Maiden and Aerosmith, the album broke into the Top 100 of the record charts and then shot to No. 1 where it remained for five weeks. Three singles from the album went Top 10 — “Sweet Child O’ Mine” was certified gold and reached No. 1, “Paradise City” hit No. 5 and “Welcome to the Jungle” earned a No. 7 slot. The band also won the 1988 MTV Award as Best New Artist with their “Welcome to the Jungle” video. “Sweet Child O’ Mine” won both an American Music Award for Favorite Single, Pop/Rock and the MTV award for Best Metal/Hard Rock Video. One was dressed as a woman, another was dressed as Tarzan and the last one was ready to sing in his underwear. They all looked outrageous, but each had the same goal: To do whatever it took to win Guns’N Roses tickets. Jackson radio station Power 92-FM gave away a pair of tickets today to the person who performed the most outrageous act at the station. As the Jack-son Sun went to press, the station hadn’t reached a decision. The concert is in Memphis tonight at The Pyramid. Shane Burkeens came dressed in a blue floral dress, stockings that plastered down the hair on his legs, and a pair of flats. His girlfriend Theresa applied his makeup and curled and rolled his hair Monday night. 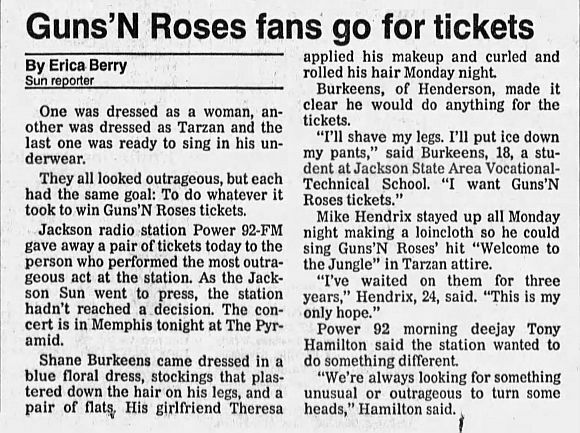 Burkeens, of Henderson, made it clear he would do anything for the tickets. Mike Hendrix stayed up all Monday night making a loincloth so he could sing Guns ’N Roses’ hit “Welcome to the Jungle” in Tarzan attire. “We’re always looking for something unusual or outrageous to turn some heads,” Hamilton said.